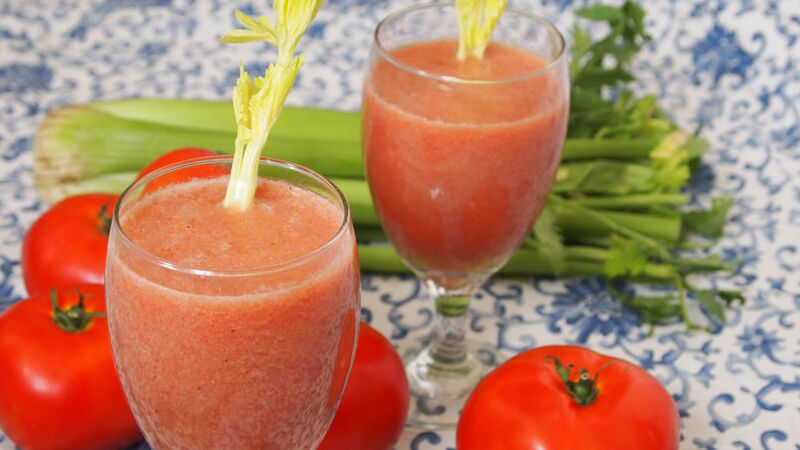 Pass the tomatoes, celery and parsley through a juicer. Season with salt, pepper, and cayenne powder to taste. Serve with ice and garnish with a celery stick. If you don’t have a juicer, a food processor can be used instead with a little water added to the vegetables. Peel the tomatoes before processing, and filter the final result through a strainer before serving. Many tomato juice recipes call for using raw onion. If you like, you can add 1/4 of an onion and 1 garlic clove. Instead of using cayenne powder, you can spice up your juice by using hot pepper sauce or paprika. Tomatoes are originally from present-day Latin America, although they have become a universal culinary ingredient. With the arrival of the Spaniards, this fruit– used as a vegetable– slowly became known little by little in other parts of the world. Now, who could imagine a pizza, a plate of pasta, or any salad without a tomato? Or how about your hamburger and French fries without ketchup? Interestingly, even though I’m Peruvian, it’s been in New York where I have learned to appreciate tomatoes in all their splendor when in season. To pass through any farmer’s market or mercado during the summer is a unique experience; what with all the shapes and colors of the tomatoes that sometimes look on the verge of exploding! Juicy, full of sabor, beautiful to the eye… this is the perfect moment to enjoy them in every way possible, and this juice recipe is a refreshing way to do it. Salud!